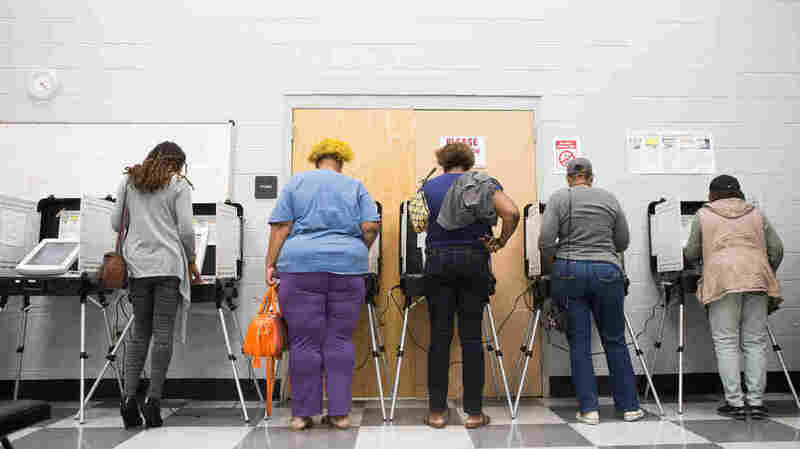 Voter Suppression Efforts By Republicans Target Minorities, Journalist Says Ari Berman of Mother Jones warns that a Republican strategy to tighten access to the ballot box could have a major impact on the 2018 elections. "It could be tainted by voter suppression," he says. Voters cast ballots during early voting last week in Atlanta. Georgia has blocked approximately 53,000 voter registrations. Since the 2010 elections, 24 states have implemented new restrictions on voting. Alabama now requires a photo ID to cast a ballot. Other states such as Ohio and Georgia have enacted "use it or lose it" laws, which strike voters from registration rolls if they have not participated in an election within a prescribed period of time. Mother Jones journalist Ari Berman, author of Give Us the Ballot, says that many of the restrictions are part of a broader Republican strategy to tighten access to the ballot — an effort that was bolstered in 2013 by the Supreme Court's Shelby County v. Holder ruling. "[That] decision," Berman explains, "said that those states with the longest histories of discrimination no longer had to approve their voting changes with the federal government." You're seeing a national effort by the Republican Party to try to restrict voting rights, and it's playing out in states all across the country. As a result, Berman says, "You're seeing a national effort by the Republican Party to try to restrict voting rights, and it's playing out in states all across the country." Many of the new voting restrictions are occurring in states like Georgia, North Dakota and Kansas, which have critical races in the 2018 midterms. Berman says that it's still unclear what the impact of the restrictions will be on the upcoming elections, but he remains hopeful that the tide might be shifting on voter restrictions. Berman points out that an amendment to Florida's 2018 ballot would restore voting rights to more than 1 million former felons who are currently disenfranchised in the state. "The 2018 election could go in two different ways," he says. "It could be tainted by voter suppression, or it could be remembered as an election in which voting rights were expanded for millions of people." On why he calls Georgia the "epicenter of the voter suppression battle"
It was reported by the Associated Press that [gubernatorial candidate] Brian Kemp's office (the secretary of state's office) in Georgia was blocking 53,000 voter registrations in that state — 70 percent from African-Americans, 80 percent from people of color. What was happening, as people were submitting voter registration applications, if their names on the voter registration forms didn't exactly match other state databases, these voters were sent a letter telling them that their applications were pending and they needed to provide more information to election officials. This was very confusing to people, because even though these pending voters could show up and vote at the polls with the correct ID — they couldn't vote by mail but they could vote at the polls — if you got a letter in the mail that said there was a problem with your registration, you probably would think that you weren't eligible to vote. So this set off widespread confusion. The fact that Brian Kemp, secretary of state, was running for office at the same time his office was doing this and that he was running against Stacey Abrams, who could be the first black woman governor in U.S. history, that really made this a huge national story. This kind of exact-match system is known as "disenfranchisement by typo" because when you submit a voter registration form, if you have a hyphen missing on your name, if you have an apostrophe missing, if you use "Tom" on one form and "Thomas" on another, your form is going to be blocked by the state of Georgia. And what's interesting to me is that Georgia first tried to put this policy in place in 2009 when it previously had to approve its voting changes with the federal government under the Voting Rights Act, and the federal government actually blocked this exact-match system from going into effect because they said it was discriminatory against minority voters, who are more likely to be flagged by this system. Then when Brian Kemp was elected, in 2010, he started doing this administratively. He was sued in 2016 by the Lawyers' Committee for Civil Rights, a voting rights group, because 35,000 registrations were flagged as "pending" under the exact-match system and there was a huge racial disparity in terms of who was flagged, and Kemp's office actually said he was going to stop doing this system. But what happened is the Georgia legislature basically reauthorized the law, gave voters more time to do this, and so a lot of people didn't even realize this law was back into effect. [Voting rights lawyers] told me ... that basically the names of people who are African-American or Latino or Asian-American tend to be more unfamiliar to election workers. So they might have names that don't match on the databases from one form to another, or election officials might actually enter the correct name incorrectly because they're confused by the spelling or they don't recognize the name. And so I think that basically people of different kinds of backgrounds are sometimes unfamiliar to the largely white officials that are running Georgia's elections, and I think that's one of the reasons why a lot of people of color are ending up on these pending registration lists. It's a huge issue, because census data is used to draw voting districts. ... The way that districts are drawn is they're based on total population. So everyone in a given area is counted when it comes to drawing a district and deciding what level of representation an area should have. What Kobach wants to do is restrict those districts to only counting people who are citizens. This question about U.S. citizenship hasn't been asked on the census since 1950. There's a tremendous fear that if it is asked, Latinos, Asian-Americans, other minorities — whether documented or undocumented — are going to be afraid to respond to the census, [and] that the areas where these people live will get fewer political seats, less money, less political representation than they otherwise would in a fair and accurate census. The census is basically the DNA for our democracy. It is the baseline for which so many things are done. The census determines how $675 billion is distributed to states and localities. The census determines how legislative districts are drawn. The census determines the composition of the Electoral College. So if this question about citizenship is added to the census, places like California and New York and Texas — which actually, funnily enough, is a red state — they could receive fewer members of Congress, they could have less influence in the Electoral College, they could have less money going to their states. And then places like Kansas, where there are fewer immigrants, where it's a lot whiter and more Republican, they're going to have more political power if this question about citizenship is added to the census like Kris Kobach wants. The big voting issue in North Dakota is that that state has recently passed a new voter ID law that was upheld by the Supreme Court earlier this month, and what's alarming about that law is that the Republicans in North Dakota wrote it in such a way that for your ID to count, you have to have a current residential street address on your ID. The problem in North Dakota is that a lot of Native Americans live on rural tribal reservations, and they get their mail at the Post Office using P.O. boxes because their areas are too remote for the Post Office to deliver mail, [and] under this law, tribal IDs that list P.O. boxes won't be able to be used as a valid voter IDs. So now we're in a situation where 5,000 Native American voters might not be able to vote in the 2018 elections with their tribal ID cards. This is sending off a tremendous amount of alarm in the state, because normally we wouldn't be talking about North Dakota. But there is a competitive Senate race between the Democrat, Heidi Heitkamp, and the Republican, Kevin Cramer. Heidi Heitkamp only won her first race for the U.S. Senate in 2012 by 2,900 votes, and she got 80 percent of the vote on the two counties in the state with the largest Native American reservations. So there is a tremendous amount of fear in North Dakota that many Native Americans are not going to be able to vote in this state, and that's going to particularly hurt Heidi Heitkamp, the Democratic incumbent. Florida is one of only four states that prevents ex-felons from voting, meaning even after you've served your time, you've paid your debt to society, you have to wait five to seven years in Florida to appeal to have your voting rights restored by the governor and his executive clemency board. One in 10 people in Florida — including one in five African-Americans in the state — can't vote because they have a felony conviction. So 10 percent of people in the most important swing state in the country ... aren't able to participate and aren't able to vote in 2018. This current governor, Rick Scott, in Florida has restored voting rights to almost nobody. You have a situation in Florida where 1.6 million ex-felons can't vote. That's a staggering number. What that means is that one in 10 people in Florida — including one in five African-Americans in the state — can't vote because they have a felony conviction. So 10 percent of people in the most important swing state in the country, that is routinely decided presidential elections, aren't able to participate and aren't able to vote in 2018. This ballot initiative would restore voting rights to up to 1.4 million people in Florida. That would be the largest enfranchisement of new voters since the passage of the Voting Rights Act of 1965. So despite all the suppression we're seeing in Georgia, North Dakota, and Kansas and other states, Florida has a chance to give the right to vote back to more people than at any time since the 1960s, and that's the good news that I hope doesn't get drowned out by all the bad news. Sam Briger and Thea Chaloner produced and edited the audio of this interview. Bridget Bentz, Molly Seavy-Nesper and Carol Ritchie adapted it for the Web.